I am writing this blog because I want people from around the world to be delighted by recipes using the edible parts of bears. 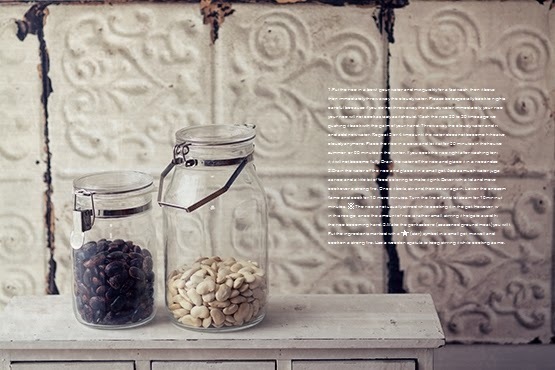 ※The measuring cups used are all the type that is used in the US. Prepare an amount of your favorite vegetables enough to fill a 16oz(500ml) measuring cup. 1.Peel the potatoes,cut into rolling wedges and soak in cold water to eliminate bitterness. Chop the onion, place it in a bowl, sprinkle with a little salt (not in the ingredient list) and mix. 2.Place the potatoes in a pot.Fill the pot with just enough water to cover the potatoes,add the salt and boil over a high heat.When it comes to the boil,reduce the heat to low and continue to simmer until the potatoes become tender enough for a bamboo skewer to pierce without difficulty. When the potatoes are tender enough,discard the hot water from the pot and place over heat again to evaporate the moisture of the potatoes.Be sure to mash potatoes while they are still hot. 3.Add mashed potatoes, salt and pepper to the same bowl where you placed the onion before and mix. Once the potatoes are cold add mayonnaise, mix, and round with your hands to make the face of the bear. 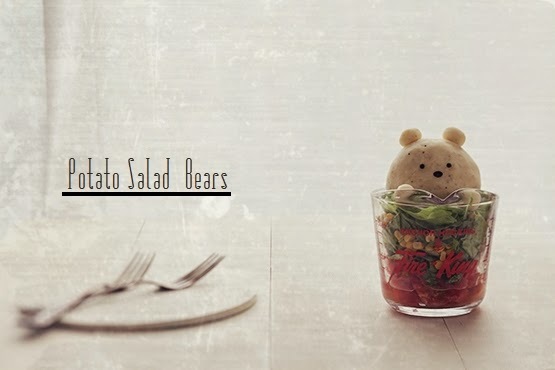 Serve the vegetables of your liking in the measure cup, put the bear potato salad on top, and decorate with carrot cut in the shape of stars. Cut out the remaining carrot with a straw to make the cheeks of the bear. Make the face of the bear by cutting small pieces of seaweed. (I used a seaweed puncher to make eyes and nose.) The seaweed puncher is very convenient, since all you have to do is place the seaweed in it and push to cut out the parts of the face. You can buy it on Amazon Japan. Adjust the amount of mayonnaise,and salt to your taste. Because this blog translates Japanese in a translation site and writes it, there may be the place where a sentence is wrong sorry. Thank you for reading this to the end. 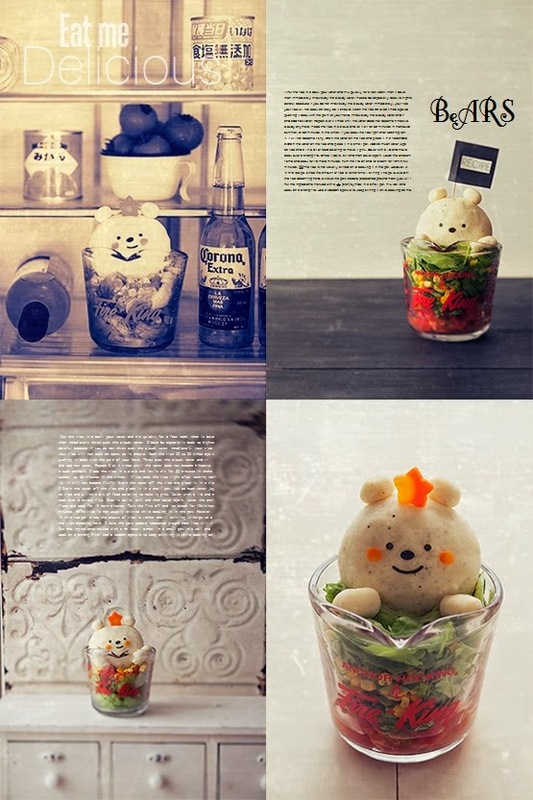 Copyright © 2014 edible bears | All Rights Reserved.. 「シンプル」テーマ. Powered by Blogger.